Visitors to the first-ever edition of China Fruit Logistica experienced the best combination of business and information opportunities for China’s fast-growing fresh produce business in Shanghai on 14-16 May. 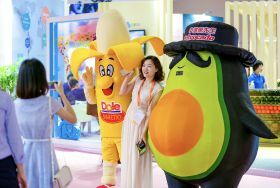 Taking place at the Shanghai Convention & Exhibition Center of International Sourcing, the launch edition of China’s leading national trade show for fresh fruit and vegetables attracted over 2,000 top-quality trade visitors and buyers, according to organiser Global Produce Events Shanghai. More than 80 per cent of trade visitors came from across China’s fresh produce business and food retail trade. China Fruit Logistica attracted strong interest from the Chinese fruit and vegetable trade, with buyers and industry professionals from 25 provinces across the country attending the show. Around half of them came from the east of the country, with Shanghai, Shandong, Jiangsu, Zhejiang, Anhui and Fujian the top six regions represented. Visitor survey results underlined the high quality of trade visitors. More than 70 per cent of visitors reported having an influence on the purchasing and procurement decisions of their companies. The top three objectives for trade visitors were to gain a market overview, establish new contacts and find new products, according to survey results. China Fruit Logistica offered unrivalled opportunities to achieve all these goals, with more than 80 per cent of trade visitors confirming a positive to excellent overall impression of this inaugural edition. China Fruit Logistica launched as the premier platform on a national scale for China’s fresh fruit and vegetable business, bringing together producers, traders, buyers, retailers and service providers from across the country with key international players. China Fruit Logistica in Shanghai is the new addition to “the trusted brand family” that includes Asia Fruit Logistica in Hong Kong, Asia’s premier continental trade show for fresh fruit and vegetable marketing, as well as Fruit Logistica in Berlin, the leading global trade fair for the fresh produce business. China Fruit Logistica’s position as the premier national platform was underlined at the opening ceremony, which was addressed by Huang Jingyi, president of China Good Agri-products Development and Service Association, and Guo Xiliang, vice chairman of the China Society of Inspection and Quarantine. Guest of honour Wan Benyi, section chief of China Customs Animal and Plant Division, was also on-hand to inaugurate the event. A diverse range of international companies from 18 different countries representing all continents also exhibited at the first edition. Exhibiting countries included Australia, Canada, China, Egypt, Finland, France, Israel, Italy, Japan, Malaysia, the Netherlands, New Zealand, Peru, Spain, Thailand, Turkey, the US and Uruguay. China Fruit Logistica visitors were also able to access a high-quality conference programme on the trade show floor offering a mix of strategic insights and practical information. Powered by Asiafruit China, part of world-leading fresh produce publisher Fruitnet Media International, the programme included three tracks – the Main Stage, the Expert Stage and the Media Studio. With the theme ‘power brands marketing for success’, Fresh Produce Forum China (FPFC) kicked off with a session looking at how to raise quality standards and build brands for China’s domestic fruit industry. Xi Lingyuan of industry alliance Fruit Ally, Jae Chun, vice-president of Driscoll’s China, and Mei Qiang of Tianxiaxingnong were on-hand to share their insights. While each had different perspectives, they all underlined the need to link consumer needs and preferences back into production to improve supply chain standards. Chun explained how Driscoll’s’ domestically-grown berries were able to retail in China for up to a 200 per cent price-premium on berries imported from South America. "How is that? Because we have worked really hard to raise the quality and consistency, and because we’re closer to the market since we’re growing in China. We understand more and more in terms of consumer expectations," said Chun. "We hear repeatedly about mistrust among Chinese consumers over food produced in China. We don’t think it’s true. We believe we can produce fruit in China that more than matches international standards." The universal challenge of building a fresh produce brand is compounded in China by the multitude of small growers. Tianxiaxingnong’s Mei said one of the biggest hurdles was getting farmers to honour supply agreements. He argued that building successful relationships depended on grower welfare, and on purchasing their products at a higher margin to develop a loyal supply base. A series of regional showcase sessions at FPFC also spotlighted the exciting work under way to raise standards across China’s fresh produce business. In a session on major temperate fruit production hub Shaanxi Province, Wang Linsong of Haisheng and Qi Feng of Qifeng discussed their work with farmers to introduce new production technology. Wang emphasised the key role for mechanisation and covered cropping, such as greenhouse systems, in raising productivity levels. A regional showcase session on Yunnan heard from two international investors in the province’s burgeoning berry industry – Peter McPherson of Australian company Costa Group and Oliver Davies of UK headquartered S&A Produce – on the work their companies were doing to introduce new high-tech growing methods and world-leading varieties to the region. One of China’s poorest provinces, Yunnan is a fertile growing region with strategic advantages and huge potential to develop its supply position domestically. Both speakers discussed their work with local farmers and government, and the role such horticulture ventures had to play in creating employment and raising living standards in the province. In Day Two’s keynote session, Zhang Yi of Beijing-based B2B wholesale company Floruit chaired a discussion on the changing landscape of the China market with Ying Jianjun of Linyi Jiaxing Market, Dang Wei, general manager of Pagoda’s Unmanned Retail Department, and Jack Gao, general manager of leading banana distributor Goodfarmer. New Retail also came under focus in the final session on Day Three at FPFC. Zha Nan of 36Kr Research Institute looked at how the merging of online and offline retail was giving rise to new models such as unmanned shelves or smart shelves. She also explained the vital role fresh produce has to play in this retail revolution to deliver new experiences to consumers. Mike Li, general manager of fresh produce for JD.com, and Loren Zhao of Freshbridge then discussed New Retail’s transformative impact on the fresh produce supply chain. Young women are the driving force of China’s fast-growing fruit consumption. A session looking at how to market more effectively to this broad demographic group provided some insightful case studies. Joanna Zheng, merchandising director at TMall Fresh, discussed a campaign the B2C platform ran for International Women’s Day in China on 8 March. She also explained how TMall was able to access and leverage on consumer data through the Alibaba ecosystem. "Every consumer has its own ID from which we can create consumer profiles," said Zheng. "We might see one lady has been to Hainan, so we will market Hainan mangoes to her on her home page. It’s like we’re speaking to them; it’s very precise and highly targeted." Meanwhile, Zespri’s head of global marketing Ng Kok Hwee demonstrated how the kiwifruit marketer had made an emotional connection with modern Chinese working mothers through a short video series outlining the strain of the multiple roles a professional mother in China plays. Zespri is focused on building a meaningful brand with contemporary women in China, she explained, and this campaign would go beyond mothers in 2018. Asiafruit China’s three-track programme featured more than 40 speakers from seven different countries. Many of the international speakers took part at the Expert Stage, where they provided practical insights and information on the best products, systems and solutions across a range of fields. Day One focused on Packaging and Marketing, Day Two on Production and Day Three on Logistics and Cold Chain. Like the Main Stage, the sessions at the Expert Stage attracted great interest from trade visitors, with strong attendance throughout the three-day show. Following its highly successful launch, China Fruit Logistica returns to Shanghai in May 2019.